Austin K8 vans & dropside trucks. Homepage. This page: Examples of Austin's forward-control three-way K8 van & dropside lorry. 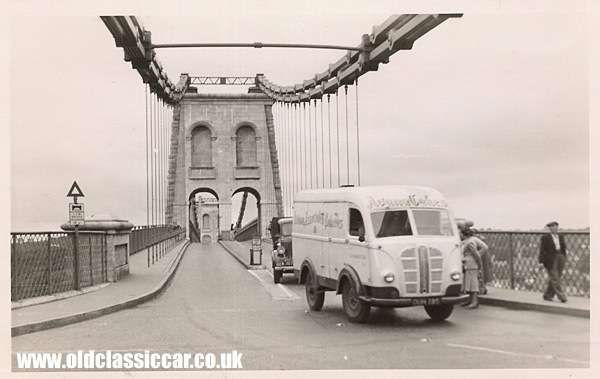 Austin van on the Menai Bridge? Another old photo found in an album, which was purchased at a car boot sale. The main subject is a 25cwt K8 cake delivery van. There is some nice detail in this photo, which looks suspiciously like it was taken at the Menai Bridge in North Wales, crossing onto Anglesey. 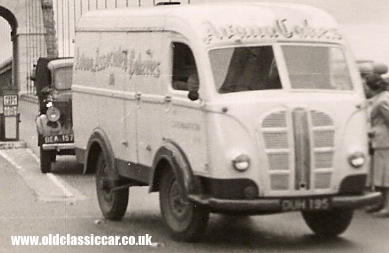 Leading the duo of classic commercial vehicles is the white K8 Austin delivery van, liveried in the colours of --------- Associates Bakeries, delivering cakes and other tasty goodies. Its registration is DUH 195, which a look on this page in the registrations section of the site, confirms is a Cardiff issue, first used in October 1947. Behind the Austin is a flatbed lorry, perhaps a Fordson, and amazingly the registration is just about visible in this shot too - BEA 157 by the looks of it (ex- West Bromwich). A passer-by in baggy trousers and a flat cap watches the delivery of cakes cruise by, although I'm not sure what the cluster of ladies is up to - perhaps they are just waiting to cross once the flatbed lorry has rumbled by. There are a few items of street furniture worth a mention here too - note the 'Keep Left' bollard in the middle of the road as it heads out over the bridge, and the 'Low Bridge' warning road sign off to the left. Curiously this old photo is printed on Air Ministry 'Reserved' photographic paper, perhaps the photographer worked for the Air Ministry and had his prints done 'at work'. I've cropped the scan down a little, to better show the two lorries. Seven years after first publishing this page on the site, another fine photo of a K8 has turned up. My thanks to Stephen for allowing me to share his photo on OCC. His great grandfather established a coachbuilding firm, H G Creasey & Sons, in 1908. Many photos survive of the vehicles they built, and Stephen's in the process of adding them to his own site. 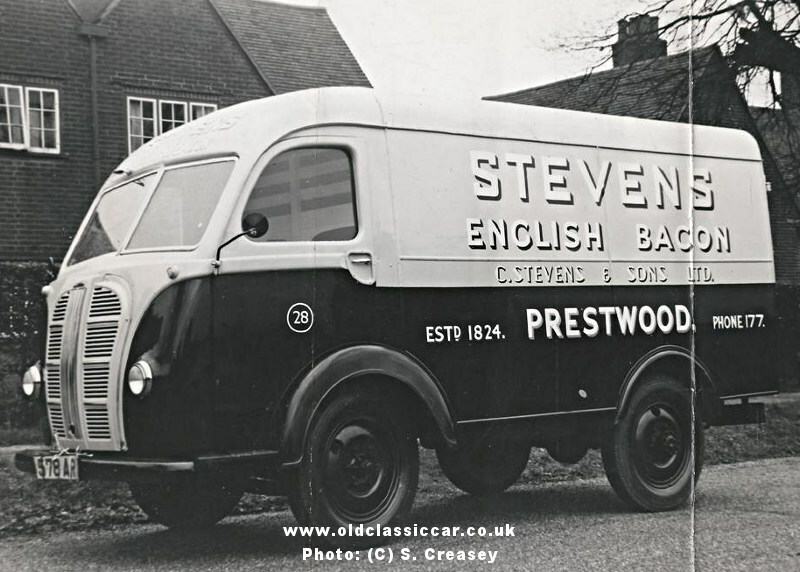 Shown below is a superb photo of a newly-built van, signwritten in the livery of C. Stevens & Sons Ltd, of Prestwood, suppliers of English Bacon. As yet un-registered, the van has a trade plate tied to its front bumper. What a great looking machine. K8s were available with either a 2.2 litre petrol engine shared with the Austin 16 saloon, or else - later in production - a Perkins diesel. 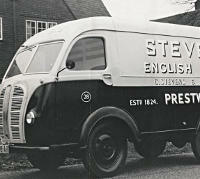 The van entered production early in 1947 and continued until 1954, surviving examples are rarely encountered today. 3. 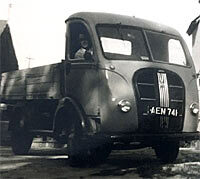 Austin K8 dropside lorry. The following photo is reproduced with the kind permission of its owner, Mike Terhorst. 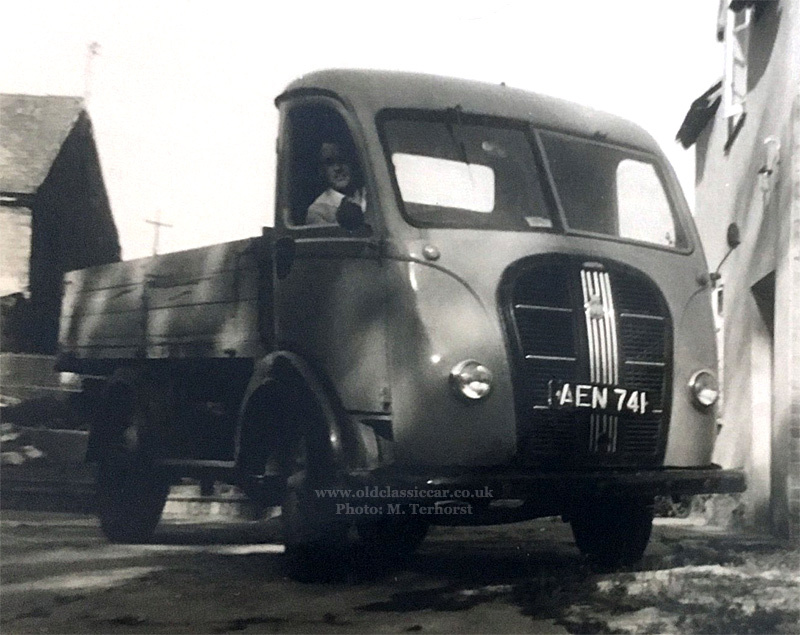 It features his father sat behind the wheel of his fine Austin K8 dropside lorry. It was registered AEN 741. A check of the EN page within the registrations section, confirms that the Austin was first registered in the Bury area. The series came into being in December 1949, suggesting that the Austin dates to early 1950. Thanks for the photo Mike. Note the RAC badge fitted to its grille. A K8 used for delivering Pink Paraffin can also been seen elsewhere in this photos section, see the K8 & Morris Y Delivery Vans page. Return to the first page in the old photos section.